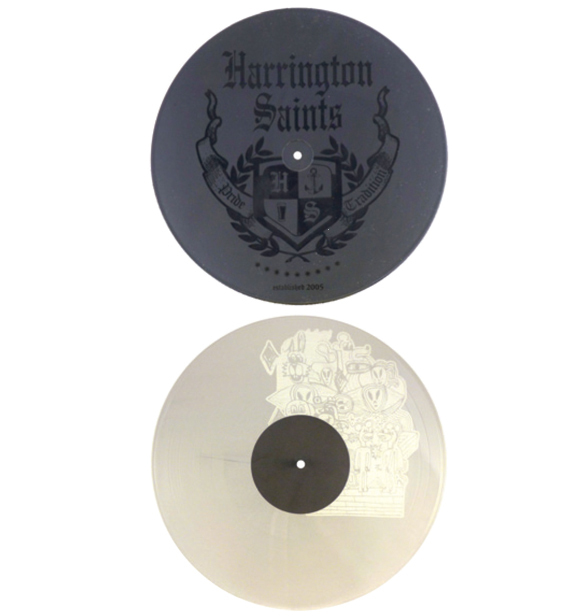 Another very popular recent trend in vinyl, especially for EP’s and singles, is to make a one-sided record, and to include an etched design on the side with no music. Cheaper than screen printed records which incur a per unit cost (especially on large runs), etched records simply require an etched copper plate and stamper to be made – a one time charge. With the right art, adding this etched image (graphic, band logo, text, etc) onto a blank side or blank area of your record can really turn heads, and elevate your record from another record just sitting in the stack to something prominently displayed on lots of walls! Please ask a Pirate for more information or pricing on etched vinyl.